Triumphs of Experience by George E. Vaillant is the latest book on the longest longitudinal study of human development ever undertaken. The Grant Study, as it is informally called, started in 1938 and studied the lives of over 200 men that went to Harvard. This book, written in 2012, recapped the physical and emotional snapshots and trends of their entire lives–most of the study men are now in their nineties or have passed on, which means it draws on over 70 years of research. It uncovers some amazing (and inspirational) conclusions that I really wanted to share. A quick note about the study itself. You may think (as I did at first) that studying men who graduated from Harvard is not exactly a normal, or even helpful, study. To get into Harvard, the men clearly were not poor or dumb, and maybe that invalidates the study’s conclusions. But, the reason it does make for a worthy study is because the sample was homogeneous in that regard. Because the men all were on a level playing field at one point in their lives gives more credence to the analyses done, as we can see the trends better. It’s the same reason the 100m dash starts at the same point on the track. To help with this problem though, the Grant study also included an “Inner City Cohort” and “Terman Women Cohort” that tracked men from a lower socioeconomic status and women, respectively, to add to the data. I won’t go into too much detail–for that, I would highly encourage you picking up the book–but there are 5 points that have stuck with me through the entire book. They are incredibly important, and I’ll summarize them here. The lasting effect of positivity, and the fleeting effect of negativity, is a major theme in the book. This is a major confirmation of the incredible resilience of the human species. The details are plentiful, but basically the study assessed dozens of factors in the men’s childhoods (warmth with parents, parents education/income, childhood temperament) and correlated them to success factors later in life (warmth in relationships, close friends, income level). The assessments were done through repeated quantitative tests and qualitative interviews performed by multiple study employees (many of them intentionally blind to other areas of the study) over the course of the mens’ lifetimes. Of the many hypotheses tested, the type of childhood seemed to be important–as any psychologists would agree–but what became obvious was that those with warm childhoods tended to perform very well in later-in-life factors, but those with cold childhoods did not always perform poorly. The effects of love are long lasting. The lack of it is only a temporary setback…if you deal with it correctly (as we’ll see in point #5). This also was shown in the chapter on marriage. They tested if divorce was a statistically negative event in a persons life–what they found was that it might be, but more importantly, a lasting relationship was positive or, as they put it, “loving people for a long time is good”. This is related to #1, but includes middle and adult life as well. In short, no matter what your upbringing was or what events happen in your life, to love and be loved heals all. There is a story of a man in the study who came from the worst childhood of the entire study. Cold parents and struggle as a child made it seem like he would be a loser throughout his entire life. But, for some reason, he focused on love. He put tons of effort into finding loving friendships, married a loving wife, and poured his heart out. His kids later recounted that their relationship with him was nothing but positive–something you wouldn’t expect from someone with such a painful past. There’s a quick excerpt I tweeted about in October if you want a glimpse into his side of the story. The book’s author filmed a TED talk on the subject as well. William James, an American philosopher and psychologist in the late 1800s said “It is well for the world that in most of us, by the age of thirty, the character has set like plaster, and will never soften again.” The study could not have proved him more wrong. Some of the most powerful stories from the book cover mens’ entire lives and their beliefs and convictions throughout them. Some were able to be three entirely different people in different phases of their life. The artistic college kid turned staunch conservative in middle life and then fully supported and joined their kids’ liberal beliefs in old age. To me, this gives me tremendous hope for the world. You don’t have to be set in your ways, no matter how old you are. 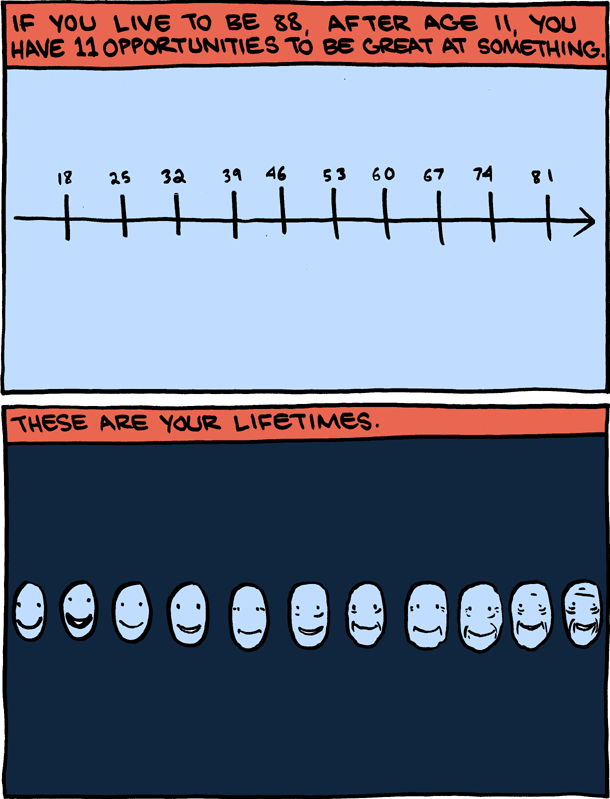 It reminds me of this amazing comic that Zack Weinersmith drew about how it takes about 7 years to master something, so you can master 11+ completely different things in your life. Read the whole thing here. You’ll love it, I promise. The moral here is that you don’t have to succumb to a life of anything. Go change. This doesn’t exactly fit with the rest of the points, but it was still one of the great findings of the study and the first of it’s kind in a lot of cases. There’s a whole history of the funding of the study itself (something like $20 million was spent overall), and how it was difficult to find funding for a large chunk of its course. To keep it going, they would often accept funding from a variety of sources, and would therefore focus their study on different factors depending on what that supplier wanted. For example, the name of the study (“Grant”) came from the original funder, who was the owner of a huge chain of Grant department stores in the 30s. He wanted the study to test for what would predict good managers in his company. The army also had interest in who would become a good officer. In the early days of the study, funnily enough, both sources thought that body shape would be a clear predictor of success. Of the three body shapes–endomorph (fat), mesomorph (muscular), and ectomorph (skinny)–they thought that being a mesomorph alone would make you a good manager/officer (this was proved wrong). Anyways, for a considerable chunk of the study’s life, different alcohol-focused groups funded it, and they wanted the study to test for causes/effects of alcoholism. The whole chapter dedicated to it is fascinating, but they basically said that it is 95% hereditary and that it is nearly impossible to control once started. Men that drank heavily (some as much as a handle of whisky a day for multiple days in a row) either had to completely abstain or were dead by 60. So, if your family has a history of alcoholism, don’t even try. If your family doesn’t have a history, drink responsibly, but you should not be in major danger of the disease. This was the biggest takeaway for me, and the most inspirational. Using mature defenses–out of the hundreds of factors and decades of analysis–correlated highly with success/happiness factors in mid/late life. It is as important as being loved. These change throughout life–often young kids will use more narcissistic/immature defenses–but should be achievable after the first quarter of your life and can be retained indefinitely. They use the term “involuntary” as a nod to the subconscious nature of them, but I believe that if someone tends to use the “lower-level” defenses, they can realize this and change (as shown in point #3 above). Even if you have a bad childhood or a number of out-of-your-control negative life events, you can focus your effort on how you react to things and change the course of your life. It’s hard to not overemphasize the coolness of the study/book. For me personally, it is the perfect combination of data analysis and subjective (but educated) interpretation, making it scientifically significant but also an easy read. Another huge favorite book of mine, Good to Great (an outline of why/how companies are successful), is written in the same way. If I could do it again, I would actually read all the other books from the study first (Adaptation to Life from 1977, Wisdom of the Ego from 1993, and Aging Well from 2002) and see how the conclusions came about, so if you’re up for it I’d recommend that 1,688 page adventure. you are a fantastic writer lee! Currently reading this book. Love the post. Thanks! That’s awesome–come back and tell me if you have any other conclusions when you’re done. Wow. I really appreciate how you simplified what is a pretty dense book. The 5 takeaways are great. Has the content impacted you in a way that has caused you to make any changes in your own life? I know personally that this book has made me very introspective. Thanks for the kind comments, John. I’m glad you liked the post. The book definitely caused changes in my life. For one, I now realize the incredible resiliency and malleability of the human race. Just because you’ve gone through hard times doesn’t mean you can’t bounce back and be happy. If you want to change long-standing habits and behaviors, you can. As long as you focus on love (giving and receiving it), you have the power to do anything. There are many more but those are the major ones. Great read. I want to reiterate John’s comment about simplifying a very dense book to a level that has compelled me to read it myself.